Abel 2218. Image credit: NASA, ESA, and Johan Richard (Caltech). Acknowledgement: Davide de Martin & James Long (ESA/Hubble). As we look at the universe on larger and larger scales, from stars to galaxies to groups to the largest galaxy clusters, we become able to perceive objects that are significantly farther away. But as we consider these larger classes of objects, they don't merely emit increased amounts of light, but they also contain increased amounts of mass. Under the best of circumstances, these gravitational clumps can open up a window to the distant universe well beyond what any astronomer could hope to see otherwise. The oldest style of telescope is the refractor, where light from an arbitrarily distant source is passed through a converging lens. The incoming light rays—initially spread over a large area—are brought together at a point on the opposite side of the lens, with light rays from significantly closer sources bent in characteristic ways as well. While the universe doesn't consist of large optical lenses, mass itself is capable of bending light in accord with Einstein's theory of General Relativity, and acts as a gravitational lens! The first prediction that real-life galaxy clusters would behave as such lenses came from Fritz Zwicky in 1937. These foreground masses would lead to multiple images and distorted arcs of the same lensed background object, all of which would be magnified as well. It wasn't until 1979, however, that this process was confirmed with the observation of the Twin Quasar: QSO 0957+561. Gravitational lensing requires a serendipitous alignment of a massive foreground galaxy cluster with a background galaxy (or cluster) in the right location to be seen by an observer at our location, but the universe is kind enough to provide us with many such examples of this good fortune, including one accessible to astrophotographers with 11" scopes and larger: Abell 2218. Located in the Constellation of Draco at position (J2000): R.A. 16h 35m 54s, Dec. +66° 13' 00" (about 2° North of the star 18 Draconis), Abell 2218 is an extremely massive cluster of about 10,000 galaxies located 2 billion light years away, but it's also located quite close to the zenith for northern hemisphere observers, making it a great target for deep-sky astrophotography. Multiple images and sweeping arcs abound between magnitudes 17 and 20, and include galaxies at a variety of redshifts ranging from z=0.7 all the way up to z=2.5, with farther ones at even fainter magnitudes unveiled by Hubble. 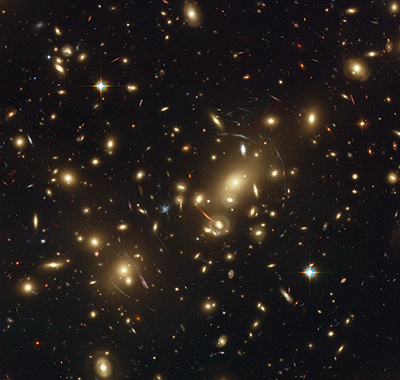 For those looking for an astronomical challenge this summer, take a shot at Abell 2218, a cluster responsible for perhaps the most glorious gravitational lens visible from Earth!